For these recipes, if your kid chef is too young to cook on the stove, allow them to help with the preparation and have the adult do the cooking. 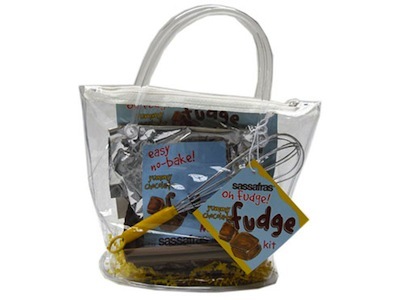 The fudge mixture will get very hot (238 degrees, usually, on a candy thermometer) so please watch kids carefully with these recipes. 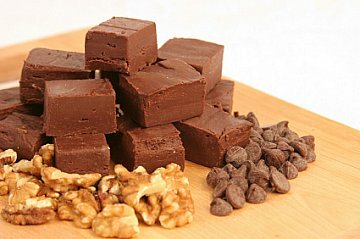 However we've included several homemade fudge recipes that you can use the microwave as well. Combine chocolate chips, vanilla and milk in saucepan and heat through stirring often. When completely melted take off heat and stir in candy bar chunks. Pour into foil lined 9x13 pan and chill in refrigerator. 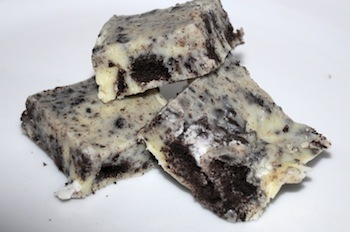 Cut into bite size squares. In saucepan stir together sugar, cocoa and milk. Bring to a boil over medium heat. Cook without stirring unless mixture comes close to burning. Using candy thermometer, cook until soft ball stage, 238 degrees. Meanwhile have the butter, vanilla and peanut butter ready to add in. Take off heat and stir in butter and vanilla. Add peanut butter and spread into a foil lined 8x8 inch or 8x 11 inch pan. Chill. Melt chocolate chips and marshmallows in large microwave safe bowl. Stir until well blended. Add in chocolate frosting and pour into greased baking dish or dish lined with tin foil. You can add chopped nuts or chopped candies on top if desired. Chill for several hours until hard. Cut into small squares. In saucepan combine chips, milk, salt and vanilla. Heat through and stir frequently until melted and well combined. Take off stove and add chopped walnuts. Pour mixture into foil lined 8x11 inch cake pan. Before chilling combine 1 ½ Cups toasted walnuts with 6 Tablespoons caramel topping. Spread evenly over top and place in refrigerator. Chill until firm and score into squares. Heat resistant rubber spatula- This can be used to wipe along edges of pan and stirring without worrying about melting spatula. In saucepan add chocolate chips, 2 T. butter, salt, vanilla and milk in saucepan. Stirring over medium heat until smooth and melted. Take off heat and add nuts if desired. Pour into 13x9 cake pan lined with foil. Set in refrigerator while making marshmallow layer. Melt marshmallows and 2 T. butter. When melted through pour over chocolate layer and swirl with a knife. Chill several hours. 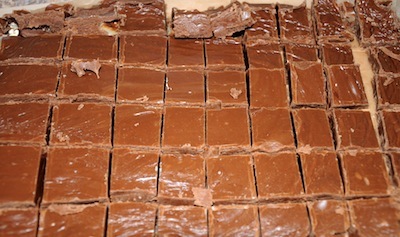 Pull fudge out by foil and place on top of waxed paper. Peel foil off and cut into squares. **Variation: Pour half chocolate mixture into pan and set other half aside. Melt marshmallows and butter as directed then pour over chocolate layer. Swirl with a knife. Top remaining chocolate over marshmallows. Chill and cut as directed above. Stir until chocolate is completely melted and pour in a prepared pan. Chill, then cut into squares. Melt all ingredients in saucepan stirring frequently. You can also use the microwave for melting the chips. Take off heat and add 1 Cup chopped peanuts if desired. Spread into 9x13 inch foil lined pan. Chill in refrigerator while making second layer. Melt chips and milk together in saucepan until smooth. Take off heat and stir in vanilla. Spread on top of peanut butter layer and chill several hours. Cut into squares. When making fudge, line cake pan with foil. Then you can simply lift the fudge out by the foil and peel foil off the fudge. Cut into squares. This step leaves you with a lot less mess to clean. In saucepan bring 4 ingredients above to a boil. Turn heat down to medium. Using candy thermometer, cook, stirring frequently, to a soft ball stage, 238 degrees. Take mixture off heat and stir in next 3 ingredients until melted. After ingredients are thoroughly melted, beat with mixer several minutes until smooth and starts to thicken. Now is the time to add any additional ingredients like chopped candy or chopped nuts. 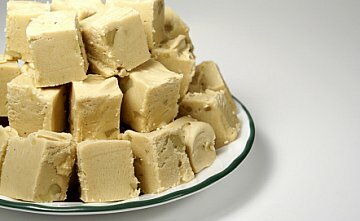 (See peanut butter candy fudge recipe below) Pour into foil lined 8x11 inch pan. Cool in refrigerator and cut in desired size squares when firm. Place 1 Cup or desired amount of M&Ms in plastic bag. With kitchen mallet chop each M&M into 2-3 pieces. (This is a great job for a younger kid chef) Using the Christmas Candy recipe for peanut butter fudge above, stir in 1 Cup chopped M&Ms to fudge right before pouring into pan and chilling. 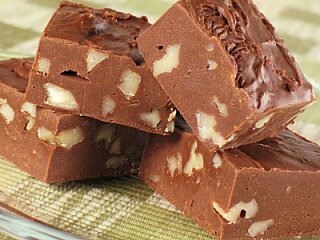 Use the Christmas Candy recipe for Peanut Butter Fudge above. After pouring peanut butter fudge into pan drizzle melted chocolate over top. You can also sprinkle chopped nuts on the top of chocolate then chill in refrigerator. In mixing bowl, mix sugar, salt, cocoa and vanilla. Add in peanut butter. Pour butter in and mix well. Line a 13 x 9 pan with tin foil and spread fudge into pan. Chill. Line cake pan 8x11 pan with foil. In saucepan over low heat, melt white chocolate, salt and milk. Stir frequently until well blended and melted through. Take off heat and stir in cookie pieces. Pour into foil lined cake pan. Chill several hours until firm. 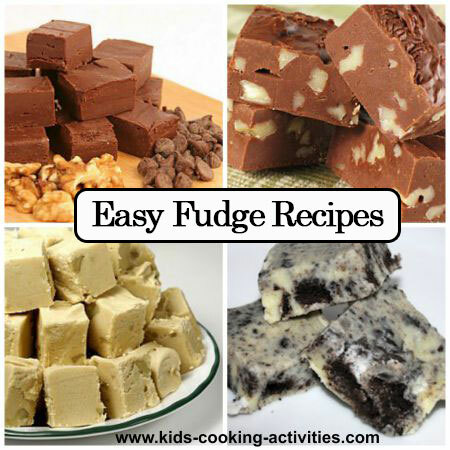 Create a Vanilla Fudge Recipe by creating the recipe above and leaving out the chopped cookies. Would you like to learn how chocolate is made?